When another strong earthquake shook the Himalayas today, people already traumatized by the devastating 7.8 temblor on April 25, reacted in panic. Buildings in Kathmandu and several Nepalese villages, which had been damaged by the last quake, collapsed completely. At least 50 people were killed in today's quake, adding to the more than 8000 deaths as a result of the bigger earthquake two and a half weeks ago. News media were quick to call the latest quake with a magnitude of 7.3 an aftershock of the 7.8 event. So did the colleagues from the USGS's National Earthquake Information Center in Golden, CO. But was it really an aftershock or was it the main shock of a new earthquake sequence? At first glance, this question may sound purely academic, given the fact that people have died and suffered, no matter what one calls today's quake. But from a seismologist's point of view there are important distinctions to be made. One is the difference between an earthquake sequence and an earthquake swarm, discussed briefly in the last blog entry. This difference is not relevant to the recent Nepal quakes. Here it is much more important to take a closer look at tectonic faults themselves. We usually like to think of a big fault like the San Andreas here in California as one solid unit, reaching more than 800 miles from the Salton Sea to Cape Mendocino. In reality, however, the fault is actually clearly segmented. The 300 mile long section of the fault from Cape Mendocino to the outskirts of San Francisco, which ruptured in the infamous 1906 quake, is one of those segments. Another segment reaches from San Luis Obispo County all the way to San Bernardino County. This 225 mile long section ruptured in the Fort Tejon quake of 1857. The fault along the Himalayan front, which demarcates the boundary line between the Indian and the Eurasian tectonic plates, also consists of distinct segments. One such segment ruptured in the April 25th quake. It extended for about 75 miles in a northwest-southeast direction, between the town of Kodari west of Kathmandu to about 20 miles east of the Nepalese capital. Earthquake maps (like ours shown here) are deceiving, because they usually don't show the extent of a quake's rupture, but just its starting point, which is called the epicenter. 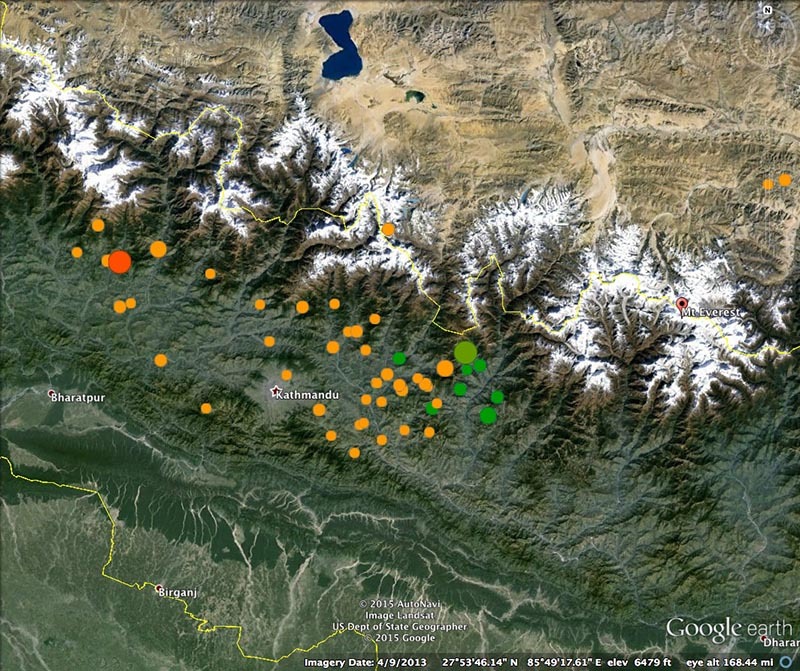 Aftershocks (orange dots on the map) are usually confined to the rupture plane of the main quake. They are thought to release the remnant stresses left behind on the rupture area by the main quake. The epicenter of today's quake was located more than 90 miles east of the epicenter of the April 25th quake - and hence just outside its rupture zone. The distribution of today's aftershocks (green dots) seem to indicate a distinctly separate rupture area towards the southeast.